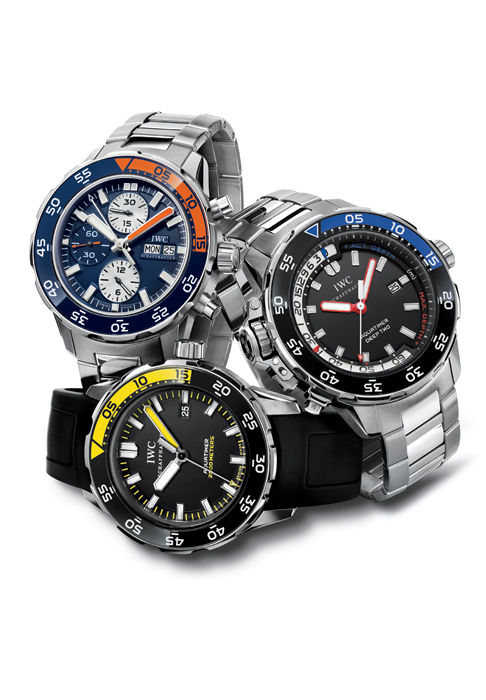 Thanks to its robustness and dependability, the diver’s watch remains the sports watch of choice to this day and doubles as a reliable reserve as the indispensable underwater back up system, even if the dive computer now relieves the underwater sportsman of most of the necessary calculations. Once again, IWC Schaffhausen has extensively revised, both technically and aesthetically, its family of diver’s watches, first introduced in 1967 under the name Aquatimer and since then further developed on a number of occasions. This step coincides with a new partnership in support of environmental and marine conservation, which IWC has entered into with the Charles Darwin Foundation in Galapagos to mark the Darwin bicentennial year in 2009. One of the new Aquatimer models, the Aquatimer Chronograph Edition Galapagos Islands, is dedicated specifically to this commitment. This new environmental commitment by IWC will start in the Darwin anniversary year – 2009 – in which the scientific world will celebrate the bicentenary of the birth of the great British biologist and behavioural scientist, Charles Darwin. He made his fundamental observations on the origin of species mainly on Galapagos, the unique archipelago in the Pacific Ocean, which was never in contact with the mainland at any time in the history of evolution. Specific animal and plant species not to be found anywhere else on earth evolved here through natural selection as a result of the differences in living conditions – even from one island to the next. This is also true of the marine life. Yet this “laboratory of evolution” is massively endangered by settlement, by illegal fishing and by the introduction of animals that are destroying the basis of existence of the indigenous species. The non-profit Charles Darwin Foundation (CDF) has more than 100 interns actively engaged in the conservation of this UNESCO World Heritage Site, which is on the “Red List”. IWC not only backs this cause in non-material ways, but also through a considerable financial contribution to support the CDF in this worthy endeavour. All have the following features in common: the case dimensions have increased slightly to 44 mm, and in one particular instance even to 46 mm. Another immediately obvious feature shared by the revised family is the rotating diving bezel, now located externally once again. IWC has always incorporated two possibilities for measuring dive times in its diver’s watches. The first Aquatimer was equipped initially with a rotating inner bezel, which was operated via the second crown. The system is particularly secure as far as unintentional adjustment is concerned, although it is not so user-friendly Fresh from the laboratory of progress Overview of the Aquatimer watch family 2009 when the diver is wearing gloves. The OCEAN 2000 watch model dating from 1982 – a result of the collaboration with Porsche Design – had already adopted an external rotating bezel, which the GST Aquatimer from 1997 also retained. The Aquatimer generation of 2009 embraces this technology once again in the form of an external rotating bezel of an entirely new design. This can be rotated even when wearing gloves – and for safety reasons only in the anti-clockwise direction. In this case, a 4-mm wide sapphire crystal ring lies above a thick layer of Super-LumiNova®* luminous pigment applied in six coats. This means that the luminescence and legibility are optimal under all conditions of visibility. The revised family picks up the yellow-black and blue-orange signature colours of the previous Aquatimer family in a number of models, but it also introduces new and interesting colour combinations for the dial, hands and indicators. A further characteristic element of the new family of diver’s watches is the innovative bracelet replacement system. The new Aquatimer is equally suitable as a sporting all-rounder and for professional underwater use. For example, a lightweight hook-and-loop strap is appropriate when diving to allow the watch to be worn over the neoprene diving suit. Wearing such a strap out of the water would be unusual, to say the least. Some prefer this lightweight material to a solid steel bracelet, but would like to change from time to time. To bring together all these preferences under a single hat, all Aquatimer models have been equipped with a new bracelet quick-change system. In response to finger pressure on the underside of the bracelet/strap lug, a lever disengages the lock ing mechanism and separates the bracelet or strap from the case. When being worn on the wrist, how ever, the watch cannot be separated from its bracelet or strap, even inadvertently. The replacement bracelet or strap (whether synthetic, rubber or steel) is then introduced into the bracelet/strap lug and engages there. This simple operation can be performed without tools in a few seconds.